WARNING: NOTE that it is very important to practice symmetrical movements only when using the mirror box. It can feel very unpleasant to leave the limb in the box still and exercise the limb in front of the mirror only. It is possible that undertaking asymmetrical movements for example keeping the hand in the box still and moving the hand outside the box or visa versa, may make your condition worse. Place your remaining extremity in front of the mirror. Visualise and attempt to move the phantom into a comfortable position whilst SIMULTANEOUSLY moving your remaining extremity (hand or foot) in the same way into the position of comfort. 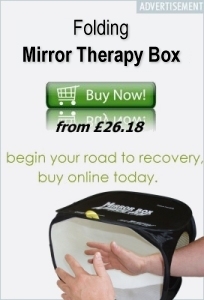 Some patients may find using the Mirror Box difficult at first, and movements painful. 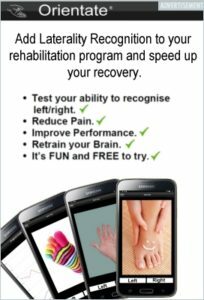 If you find this then consider practising to visualise moving your affected limb first, think about easy movements initially such as clenching or unclenching your toes or fingers and then move on to visualising more complex movement such as kicking a football, washing your face or buttering a slice of bread. Once visualisation is comfortable, and this may take several weeks, move back to using the mirror box with simple symmetrical movements. See Dr Ilan Lieberbman’s video presentation on Mirror Visualisation Therapy; it covers what it is, the history, the theory, the evidence and how it used.This 4 part video is aimed at those looking to start using mirror therapy as well as those who want a little more insight to the medical theory.